Fun was had at the cost of a bruised ego, shoulder and hip. Came home this weekend from Indiana with a couple bruises and a pulled muscle. Raven needs an adjustment on a front turn signal and one helluva bath. She is more brown than black. My most excellent street tires did most excellently poor in the mud and left Raven and I on our sides 1/2 way up a muddy slope. There are many thanks that need to be given to those who helped me push her the rest of the way, nearly dropping her again a couple times because the tires just would not find purchase in the slick mud. Rained half the day, but the beginning was great, nice and cool and a lot of fun. Yep, at just over 11000 miles, I dropped the bike. I really wanted to make it the whole year, but at least it was at less than 5 miles an hour into soft ground and I landed on an embankment. Could have been a lot worse, with all kinds of broken parts and bones and such. I ended up with a bruised shoulder (landed on a stump) and hip (rock) and pulled a muscle in the same hip trying to keep her upright. Raven came out with a slightly bent left turn signal (which still works) that I need to re-brace when I get it cleaned up and the whole side covered in mud. Some washed off in the 3+ hours left in the rain, but not all. I got back to the park, grabbed my drybag (with clothing and such) and made sure the tent was zipped up tight. I tried the Inn at the park, but there was no vacancy, so I went up the road and stayed. There were a few other bikes there, so I got a room there last minute. Decent place, when you are cold and wet. Took me an hour to get things hung to dry and get warmed up in the shower. Decided that some bourbon and pizza and some TV made for a good night in from the rain. Woke up Sunday, bright and early, got packed and dressed (in dry gear, except for the gloves) and headed to the park to tear down the campsite. 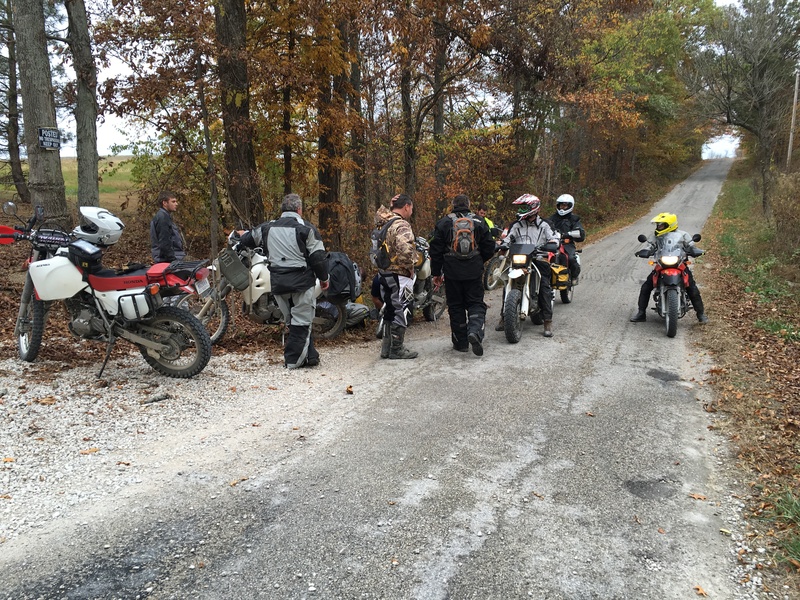 Ran into the rest of the guys at the camp (thanks for the concern, it is appreciated) and they took off for more riding while I got stuff stowed on the bike and headed out. 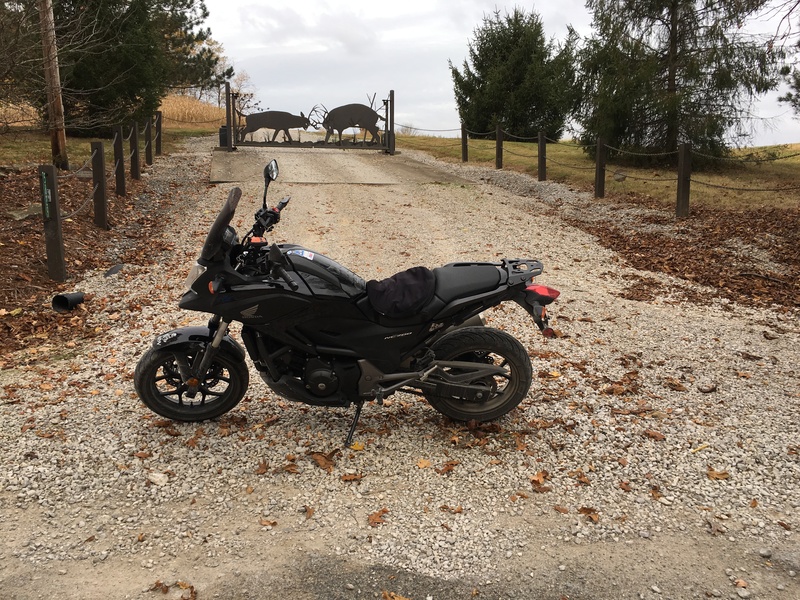 I rode around the park to get some video of it and then pointed my tires south and east, putting on about 140 miles on my way home. Definitely more than a straight shot. I got home after 1PM and got stuff unpacked and in the wash. The gear will be washed this week (mostly former mud) and Raven probably this weekend. WD40 is in need first, I think there is grit in the keyhole and the chain is completely dirty. What did I learn? No more dirt/mud on street tires. I will find a way around next time. This entry was posted in Weekend Trip.